Mary Blair’s “Cinderella Magic Coach” concept painting (Walt Disney, 1950) sold for $60,000. DALLAS – A new auction record for artwork by Disney Legend Mary Blair was set when her “Cinderella Magic Coach” concept painting (Walt Disney, 1950) sold for $60,000, triple its estimate, lifting the final total for Heritage Auctions’ animation art auction on June 16-17 to $1,456,032. Blair’s works were in high demand at the auction. “Cinderella Magic Coach” was the top lot of the two-day auction and had 20 bidders; her artwork claimed four of the top five spots. 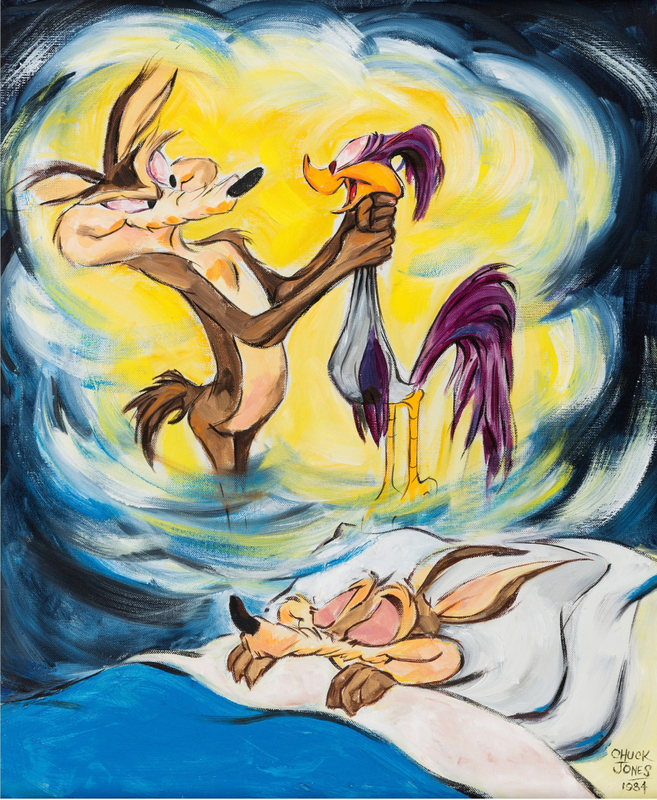 One of the most popular cartoons ever made comes to life in a Chuck Jones’ “The Dream, Wile E. Coyote and Road Runner” oil painting (1984), which brought $24,000. The painting is by legendary Warner Brothers director Chuck Jones, who created the characters and was an Academy Award-winning animator, producer, studio head, filmmaker and artist. Mary Blair’s “Cinderella King’s Castle,” concept painting (Walt Disney, 1950) mirrored the competitive bidding afforded the top lot, nearly tripling its estimate before closing at $21,000. The image was done for Cinderella, one of three blockbuster cartoons that helped the Disney Studio recover after difficult post-war years in the late 1940s. Thanks to the efforts of 24 bidders, Mary Blair’s “Song of the South, Georgia Forest” concept painting (Walt Disney, 1946) nearly tripled its estimate when it drew a final price of $19,200. Like this image featuring silhouette images of Br’er Rabbit, Br’er Fox and Br’er Bear, Blair’s paintings of Georgia fields, dusty roads, wooden shacks and plantation mansions were adapted for the special effects sequences in Song of the South. Chuck Jones’ “The Dream, Wile E. Coyote and Road Runner” oil painting (1984), brought $24,000. Multiple bidders aggressively pursued another Blair lot when her “Peter Pan Mermaids” concept painting (Walt Disney, 1953) nearly quadrupled its estimate by finishing at $19,200. Blair’s enormously popular mermaids can be seen in many different colors, as the artist experimented with the palette. Eyvind Earle’s “Sleeping Beauty Princess Aurora” background color key art (Walt Disney, 1959) is another work that drew heavy bidding, realizing a final price of $19,200. Inducted as a Disney Legend in 2015, Earle’s work on Sleeping Beauty earned him the greatest acclaim. This striking background color key/concept painting shows Princess Aurora, just days before her 16th birthday, sitting in her father’s castle window, in front of a background that includes Earle’s signature depiction of trees and the sun. Among the most intriguing lots in the auction were 76 lots from the collection of June Foray. Known best as the voice of Rocket J. Squirrel from Rocky and Bullwinkle, Foray was a Hollywood heavyweight behind the scenes, responsible for creating the Oscar for Best Animated Feature, the Annie Awards to recognize those in the field of animation and the Hollywood chapter of the International Animated Film Association. The top lots from her collection in the auction included, “Rocky and Friends, Rocky the Flying Squirrel and Natasha” cel (Jay Ward, 1959), that went to $10,800. 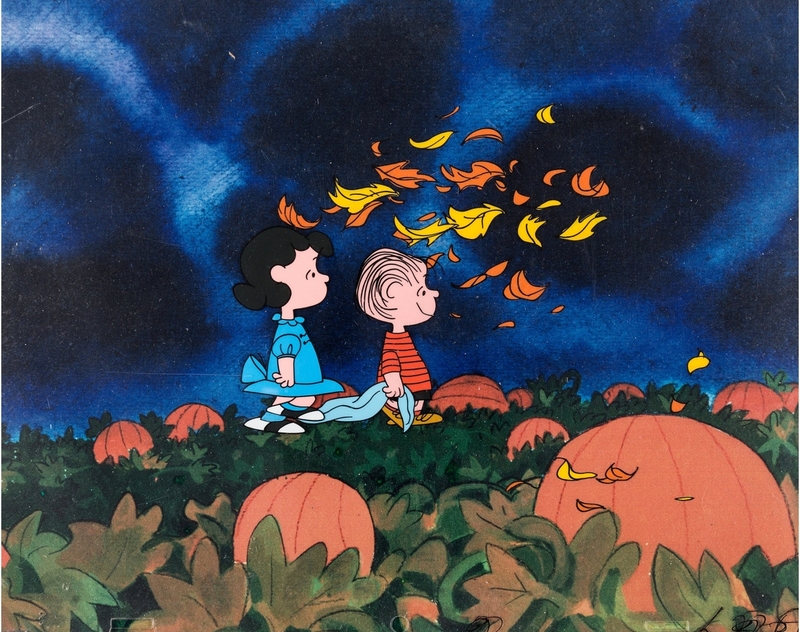 Peanuts also drew considerable interest from collectors, including “It’s the Great Pumpkin,” Charlie Brown, Lucy and Linus production cel setup (Bill Melendez, 1966), which realized $9,000; and another “Charlie Brown Thanksgiving” production cel setup on key master background (Bill Melendez, 1973), which sold at $5,520. Prices, with buyer’s premium, as reported by the auction house. For further information, 877-437-4824 or www.ha.com. 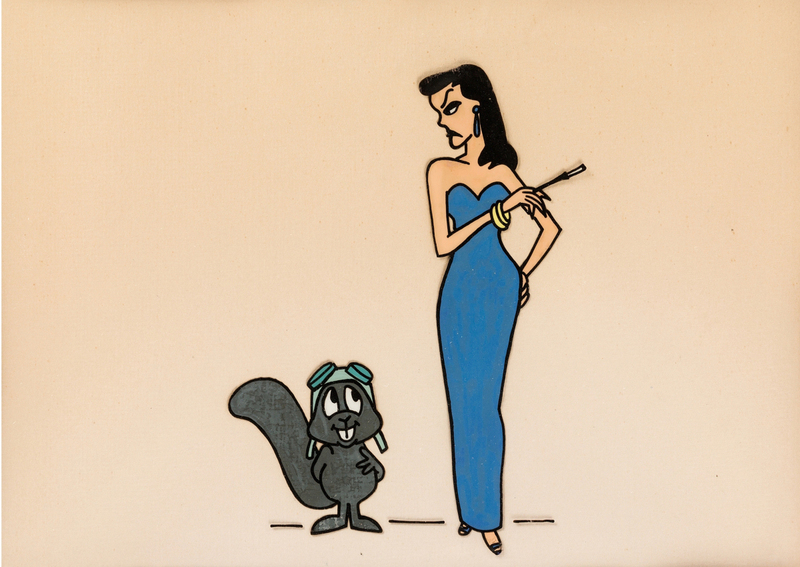 Rocky and Friends, “Rocky the Flying Squirrel and Natasha” cel (Jay Ward, 1959), flew to $10,800.